“During the grape harvest of 2013, I was visiting Tenuta Il Poggione in Montalcino, home to some of Italy’s most expensive wines. As I walked the vineyards with winemaker Fabrizio Bindocci, harvesters all around us carved gorgeous, lush, fully ripe bunches of Sangiovese grapes from the vines. And then they dropped them on the ground, like throwing out the trash. And Bindocci didn’t even mind. 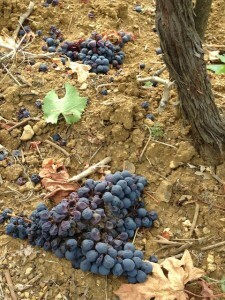 In Montalcino, it’s perfectly normal to discard an alarming percentage of your total production, a practice called “dropping fruit” that slices il Poggione’s yield by up to 50%. In fact, it’s expected, even though those grapes would otherwise be crushed and matured into top-quality Brunello, which fetches about $75 per bottle. I asked Bindocci to walk me through the math of Brunello di Montalcino’s business model. Why would you want to literally cut profits off the vine? The quality of the wines from Montalcino ar great. Not only the Brunello. Check this out. The Il Pogiione Rosso de Montalcino is a younger, much more accessible version of Brunello, but already very well-developed having a powerful character. It is also called the baby-Brunello. The quality of the wines from Montalcino are great. Check this out. The Il Pogione Rosso de Montalcino is a younger, much more accessible version of Brunello, but already very well-developed having a powerful character. It is also called the baby-Brunello.